This pattern is only available through my newsletter. 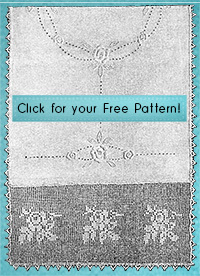 You can sign up to recieve the newsletter in your inbox here: http://claudiabotterweg.com/newsletter-get-free-patterns. This versatile design created by C.H. Green in 1918 can be used as is for a pillow cover, or repeated for a bedspread, tablecloth and other large projects. Add or remove plain space rows to vary the openness of the snowﬂakes. And use the snowﬂake as a repeat in insertions or edgings. This is not your usual scanned vintage crochet pattern. To make this pattern great for today’s crocheter I wrote complete instructions, expanded the written instructions so you won’t need to skip around, and made an easy to follow chart. I also changed the written instructions to use modern US crochet terms. The only stitches you need to know to complete this lace are: chain stitch and double crochet.